A few words by John . 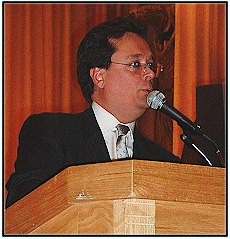 . .
View this Document On April 15, 2003, New Jersey Lawyer John F. Renner was honored for his volunteer work on behalf of September 11th victims and their families. 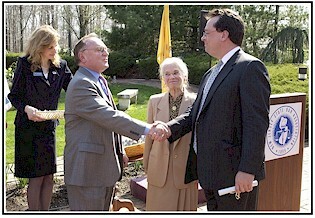 The tribute was held at the New Jersey Law Center in New Brunswick, New Jersey at which time John F. Renner received a Proclamation signed by Governor James McGreevey in his recognition of his efforts as part of the September 11th Legal Response Team sponsored by the New Jersey State Bar Association. The Proclamation was presented to Mr. Renner by Richard Badolato, President of the New Jersey State Bar Association and Deborah T. Poritz, Chief Justice of the New Jersey Supreme Court.